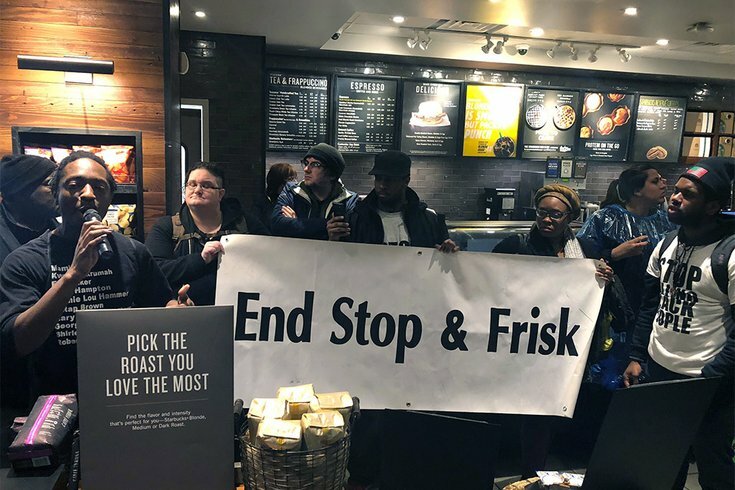 Protesters were back early Monday at the Starbucks shop at 18th and Spruce streets in Center City. A recent survey reports that white Americans are more likely to think the arrests of two black men at a Philadelphia Starbucks was an isolated incident and not a sign of a broader societal problem of racial bias. The survey conducted by HuffPost/YouGov between just April 19 and 20, asks a myriad of questions to white-, black- and Hispanic-identifying Americans about their levels of comfort in public spaces based on their races. According to the results, white people are less likely to worry they’ll be perceived as doing something wrong than black and Hispanic people, and they are more likely to feel comfortable asking to use the restroom in a store or restaurant where they hadn’t purchased anything. Perhaps the most controversial result from the survey is that a majority of white respondents believe the mens' arrests was an isolated event. This strikes a harsh comparison to the 57 percent majority of black respondents who beg to differ. When black respondents were asked whether in the last year they had been treated unfairly in a store or restaurant because of their race or ethnic background, a quarter of respondents said yes. Less than half said no, and 34 percent responded they were unsure. A note on this survey: Huffpost/YouGov relies on a model-based margin of error, rather than methodology for random probability sampling. This way of looking at responses to a survey relies on the assumption that every response (and respondent) will provide unique responses, and is independent from each other. This is something to keep in mind when analyzing this survey. To take a deeper dive into how the results of the Starbucks survey were compiled, read the explanation on YouGov.com's site. Interestingly, the survey also politicizes the recent events. Respondents were asked who they voted for in the 2016 presidential election, and then asked if the Starbucks incident represents a broader pattern of racial bias. Data shows that 69 percent of Hillary Clinton voters affirmed this, while just 9 percent of President Trump voters said the same. More than half of Trump voters reported that Starbucks is doing too much in response to the incident. That store manager has since left her position, according to a Starbucks spokesperson that told The Inquirer, after a “mutual” agreement.